iHerb is an online retailer for natural supplements, grocery products and health and beauty supplies for the consumer seeking high-quality natural ingredients and responsible manufacturing processes. When iHerb was launched in 1996, the company was dedicated to promoting the healing benefits of St. John's wort. From that singular focus, the company has expanded over the past 15 years to include more than 30,000 products. An expansive Moreno Valley, California, warehouse is climate controlled to keep all shelf products at optimum storage temperatures between 74 and 75 degrees Fahrenheit. Some products require refrigeration or freezer containment and the facility has walk-in coolers and freezer units to keep the products fresh and stable. In order to maintain the product quality, iHerb monitors inventory closely to ensure products are constantly being sold and replaced rather than remaining on the shelf for extended periods of time. iHerb continually strives to meet the internal mission statement goals and its strong commitment to customer service. In keeping with this vision, iHerb focuses on providing an online environment that is simple for consumers while providing security features to protect personal information. Since the company depends on repeat business and word of mouth for sales, every effort is made to ensure consumers can easily locate the product or products they are searching for, place an order quickly and efficiently and receive orders quickly. Just a few of the thousands of products offered are vitamins and mineral supplements, Probiotics, pet supplements and food, household cleansers and health and beauty items like toothpaste. Consumers will find an extensive list of products and iHerb only partners with brands that hold the same standards for product manufacturing and packaging. 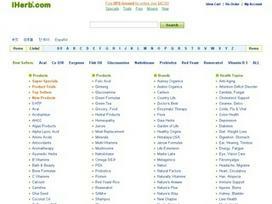 iHerb offers products made by Now Foods, Natural and Madre Labs, just to name a few. Besides offering the best selection of natural products as the best price with speedy shipping, iHerb also cares about the environment. Company recycling protocol ensures that all packaging from manufactures is recycled, plus 90 percent of the shipping containers are made with 100 percent post-consumer paper products and the packaging material is made from at least 40 percent recycled material. Every customer contributes to the efforts to be globally responsible by ordering through iHerb. The company offers consumers a vast array of natural products at value-packed prices. Additionally, there are several shipping options to fit consumer time-schedules at low rates or free with certain purchase limits or a free shipping code. All products are available in the United States and internationally. iHerb provides customers access to information about health and nutrition that they need to make informed purchasing decisions. Information is available on the website regarding new products, product benefits and side effects and nutritional information. Before making a purchase, the consumer has access to an expiration date and use by date for all products. iHerb knows consumers have choices--the best way to gain loyal customers is to provide exceptional products at affordable prices in an easy to use online format. iHerb does all that--and then some. Share what you think about iHerb, and your favorite ways to save there!